The final numbers aren’t in yet, but the American Pet Products Association estimated pet-related spending to top $60 billion in 2015. Based on what I spend on my cat and dogs, I believe it! And, projections for 2016 will be even higher. What does this mean for you? 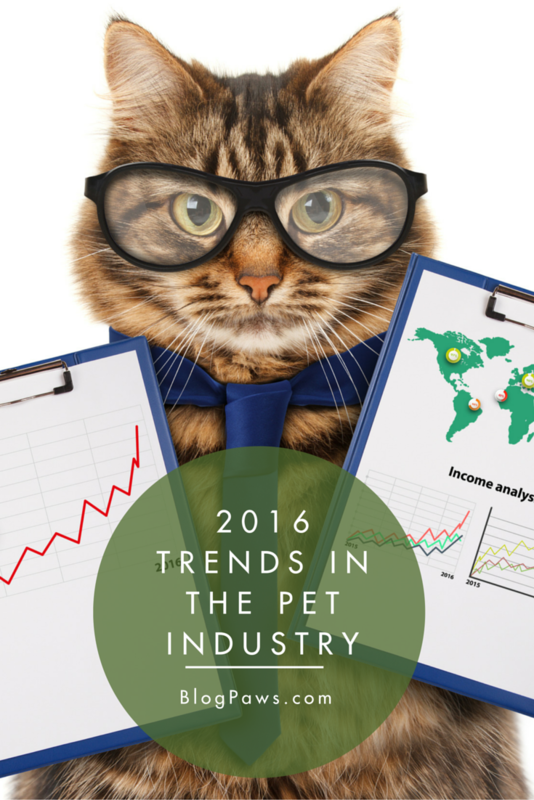 As you plan your content for the year ahead, consider the projected 2016 trends in the pet industry. Those are the hot-button issues that pet parents will be searching for in the coming year. Do any of these five topics apply to you or your pets? How can you integrate these trends into your content plan? Hopefully these five will spark some ideas for your editorial calendar. In a survey conducted by Packaged Facts, approximately 46 percent of cat owners and 45 percent of dog owners have a senior pet. Likewise, according to the Association for Pet Obesity Prevention, more than half of the dogs and cats in the United States are overweight or obese. If your pets fall into either (or both) of those categories, brainstorm some content ideas to cover the trends. A couple to consider: a product round-up of the best gear for senior cats or a weekly tweet documenting your pet’s weight loss. Until recently, “premium” and “natural” were synonymous to retailers. Consumers, on the other hand, didn’t see it that way. In 2016, be prepared to see a separation between premium pet products and natural pet products. You might see more grooming items marketed as upscale, for example, or luxe versions of pet staples (think: rhinestone-studded cat collars and “mommy-and-me” cosmetics). Meanwhile, the natural category is expanding on its own in conjunction with an emphasis on sustainability (check out trend #5 below). If this fits with your blog or your social channels, these trends lend themselves to stellar photography. Matching pedicures or a graphic comparison of ingredients could illustrate these trends to your readers. Every segment of the pet industry has been affected by one meta-trend, the over-arching concept of humanizing pets. While the term “humanization” has been a hot-button issue in animal training, in this instance it means something very different from the “anthropomorphism” that sparks critics. In this case, the humanization of pets is all about quality and safety. For example, consider a company that produced a life jacket for dogs for many years. It sold fairly well, but it wasn’t made from the same material that human life jackets were made from, and consumers demanded a better product. So, the manufacturer produced a jacket that was as good as those made for surfers. Or, in veterinary medicine: Procedures like hip or renal transplants are now common in veterinary medicine because pet parents are demanding human-quality treatment for their animals. The content ideas here are limitless. How is your pet experiencing the quality long demanded for humans–in products, in food or ingredients, in medical treatment, and so on–but only recently showing up for cats and dogs? Grooming is huge for both dogs and cats. Pet sitting is huge. Dog walking is huge. As lives get busier, there’s an increased demand for pet-related services. Service businesses with a social or blog presence can leverage this trend with helpful content. Bloggers who utilize these services can write useful tips-and-tricks style posts to help pet parents who are seeking info on services. Natural, as mentioned above, and eco-friendly often go hand-in-hand but are no longer lumped together. The eco category goes far beyond food. Eco-friendly is leaning heavily on environmentally-safe manufacturing, as well as naturally-derived or organic ingredients. Until recently, the demand wasn’t great enough to impact price; eco-friendly products were often priced much higher than conventional competitors. Look for that to change as consumers are demanding safer alternatives for their pets and for the planet. Lots of products are out there to cover, of course, but approach this from a unique angle to get traffic for your trend coverage–challenges, stories, photo diaries, and so on. Looking for an awesome resource? Check out the Pet Industry Sustainability Coalition. 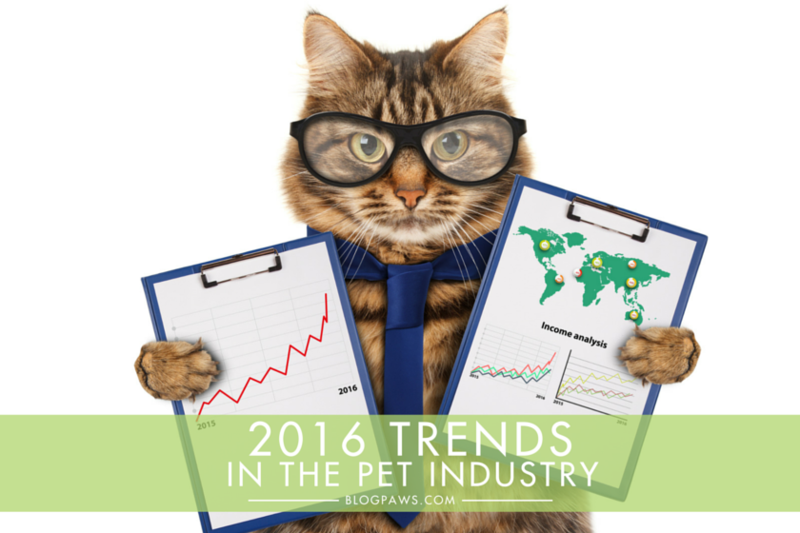 Are you planning any 2016 trends in the pet industry coverage? What questions do you have about these trends or ideas on how to cover them for your audience?